ERGÖNÜL MB, ERDOÄAN S, ALTINDAÄ A, ATASAÄUN S (2016) Rotifera and Cladocera fauna of several lakes from the Central Anatolia, Marmara, and Western Black Sea regions of Turkey. Turkish Journal of Zoology 40: 141-146. UstaoÄlu MR, BalÄ±k S, Åipal UG, Mis DÖ, Aygen C (2010) Buldan Baraj Gölü (Denizli) planktonu ve mevsimsel deÄiÅimi. Ege J Fish Aqua Sci 27: 113-120. UstaoÄlu MR, BalÄ±k S, ÈÄ°pal UG, Mis DÖ, Aygen C (2010) Seasonal Change of Plankton in Buldan Dam Lake (Denizli). 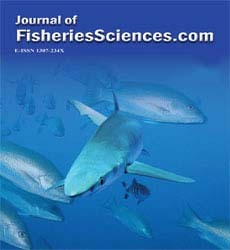 Journal of Fisheries and Aquatic Sciences (Su Ürünleri Dergisi) 27: 113-120. BOZKURT A. A taxonomic study on the families Lecanidae and Lepadellidae (Rotifera: Monogononta) of Turkey and three new records for Turkish inland waters. Turkish Journal of Zoology 40. DoÄan G, Ä°zci L (2016) Effects on quality properties of smoked rainbow trout (Oncorhynchus mykiss) fillets of chitosan films enriched with essential oils. Journal of Food Processing and Preservation. YILMAZ S, YAZICIOÄLU O, Yazici R, Polat N (2015) Relationships between fish length and otolith size for five cyprinid speciesfrom Lake Ladik, Samsun, Turkey. Turkish Journal of Zoology 39: 438-446. Dehghani M, Kamrani E, Salarpouri A, Sharifian S (2016) Otolith dimensions (length, width), otolith weight and fish length of Sardinella sindensis (Day, 1878), as index for environmental studies, Persian Gulf, Iran. Marine Biodiversity Records 9: 44. Dehghani M, Kamrani E, Salarpouri A, Kamali E (2015) Relationship Between Fish Length and Otolith Dimentions (Length, Width) and Otolith Weight of Sardinella sindensis, as Index for Environmental Studies, Persian Gulf, Iran. Journal of Fisheries & Livestock Production. DÜÅÜKCAN M, ÇALTA M, EROÄLU M (2015) Keban Baraj Gölü’nde YaÅayan Barbus grypus Heckel, 1843’de Otolit Biyometrisi-BalÄ±k Boyu Ä°liÅkisi (ElazÄ±Ä, Türkiye). Yunus AraÅtÄ±rma Bülteni 15(3). Husen MA, Sharma S (2014) Efficacy of anesthetics for reducing stress in fish during aquaculture practices-a review. Kathmandu Univ J Sci Eng Tech 10: 104-123. Sarameh SP, Falahatkar B, Takami GA, Efatpanah I (2013) Physiological changes in male and female pikeperch Sander lucioperca (Linnaeus, 1758) subjected to different photoperiods and handling stress during the reproductive season. Fish physiology and biochemistry 39: 1253-1266. Ulkhaq MF. Pemberian Probiotik Bacillus pada Media Pemeliharaan Ikan Lele Dumbo (Clarias gariepinus) untuk Pencegahan Penyakit Motile Aeromonads Septicemia. Mendoza FJ, Cantú EM, Leal JM (2015) Parámetros hemáticos en tres especies de peces (Ictalurus punctatus, Morone saxatilis y Micropterus salmoides) en condiciones de desnutrición/Hematological parameters in three species of fish (Ictalurus punctatus, Micropterus salmoides and Morone. RIDE Revista Iberoamericana para la Investigación y el Desarrollo Educativo 3: 1-23. Samuel PO, Adakole JA, Suleiman B. Effects of Some Heavy Metal Pollutants On Glutathione Production In Clarias Gariepinus (Burchell, 1822) In An In Situ Bio-Assay In River Galma, Kaduna State, Nigeria.